It can be difficult to discern the difference between an Infrared Sauna and a regular steam sauna. To help you understand how these saunas compare and which one would benefit you the most, let’s take a closer look at each sauna. 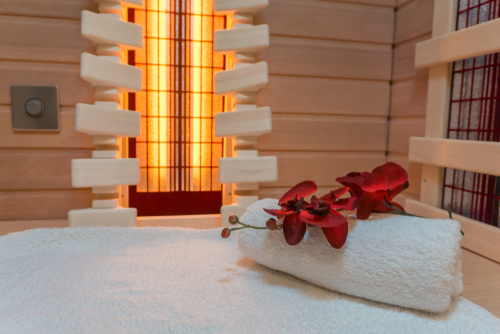 Infrared Saunas use infrared heat to create a relaxing, warm environment. This heat improves a person’s circulation and reduces their pain. The Low humidity and modest air temperature can also help with weight loss and detoxification. According to published scientific literature about infrared saunas, the biggest benefit is to a person’s heart health. These saunas help normalize blood pressure and reduce the risk of congestive heart failure. Some doctors have started recommending the use of saunas to their patients who have high blood pressure or who are at risk for heart issues. Some users of Infrared saunas noticed improved weight loss with regular use. The weight loss is often caused by the efficient heating of the body, the increased perspiration which removes toxins, and increased metabolic rates. The combination of the previously mentioned factors can improve a person’s metabolic rate by up to an extra 300 calories burned per hour. A 30-minute session in the sauna burns around 600 calories on its own, which is great if you are looking to lose weight. As your core body temperature goes up from the heat of the sauna, your circulation increases with it. Many people have found that the consistent use of an infrared sauna can improve blood flow and muscle recovery, which is why most gyms have a sauna. If you are suffering from joint pain or muscle aches, going to an infrared sauna could offer you some relief because improved circulation can help reduce the inflammation. The heat from the sauna also relaxes the muscles, so the pain is reduced. Infrared saunas promote more perspiration than steam saunas. This is because the infrared rays penetrate deep into your body, increasing your body’s blood flow, breaking up water molecule clusters, and promoting the release of toxins from the body. This detoxification helps improve your overall health. The lower temperature of infrared saunas tends to be more comfortable and easier on the body. However, if you have eye, lung or breathing issues, the higher heat and humidity may be very uncomfortable for you. Infrared saunas offer lower temperatures and humidity, so you can relax in comfort. Once you leave an infrared sauna, your body has to start cooling its interior temperature down. The relaxing properties of the sauna along with your body’s efforts to cool your internal temperature can actually help you get a better night sleep. Heat stress is good for cognitive functions because it stimulates neurogenesis, which is the growth of new brain cells and protects the existing neurons from damage. The heat also boosts norephinphrine levels, which is the hormone that improves attention and focus. There is also increased levels of prolactin, which is a hormone that improves the growth of myelin. Myelin is the insulation around the nerve fibre in the brain that affects how fast your brain works. When you are sitting in a sauna, your white blood cells increase in the bloodstream. This could be due to the body naturally raising your temperature when you are sick. The extra white blood cells help you fight off illness before you get sick in the first place. So, you may want to head to the sauna before and during cold and flu season. Long, grey, bitterly cold winters can really affect your mood. SAD or Seasonal Affective Disorder can impact anyone and is often caused by the seasonal changes. The low temperatures and lack of sunshine have a way of zapping a person’s energy levels. So, spending some time in the sauna releases the needed hormones, which reduce symptoms of depression including pain, aches, anxiety, and appetite. Steam creates an environment that has high humidity and heat, which offers a variety of health benefits. People who are dealing with blemish prone skin may find that the high humidity and the steam helps balance oil production and help them have clearer skin. Dry skin users may experience more hydrated skin when using a stream room regularly. Some users experienced relief from allergies, cold symptoms, and sinusitis because the moist air opens the nasal passages and sinuses, which allowed for clearer breathing. However, some users found that the moisture and the heat made their symptoms worse. Warming up in a steam sauna before a workout can help you reduce the risk of injury. It can also help you reach maximum mobility during activities such as yoga, running, and Pilates. Women especially benefited in studies from the heat therapy before and after their workouts. The sauna’s heat causes the body to release endorphins and other hormones that reduce the feelings of stress. Many people feel calm and rejuvenated after using the sauna, which is due to the increased hormone levels. A New Zealand study found that visiting a sauna before working out can boost athletic performance. The study focused on male long-distance runners who used the sauna after their workouts. The next day, the participants increased the amount of time they could run by an average of 32 percent after using the sauna. In a study published in the Journal of Alternative and Complementary Medicine examined the use of saunas to reduce pain and treat chronic-type headaches and frequent headaches that occur over 15 days per month. After eight weeks of sauna exposure, the participants reported significant improvement in their headache intensity. Some participants had lasting effects of two years after finishing their sauna therapy. This can sound a bit weird and creepy, but it’s true. Going into the sauna with a friend or your partner can improve your relationship. It can also help you make new connections. The reason that social interactions are easier in saunas is that you are all essentially naked, both physically and mentally, so you are more likely to have an honest conversation with other people. However, some people simply enjoy solitude in the sauna, so just leave them be. What Sauna is Right For You? Both infrared saunas and steam saunas offer a number of health benefits. Saunas can reduce stress, help you relax and improve your overall health. Before picking which sauna you should use, you should review what features would benefit you the most and if you have any health concerns that could become worse from heat and high humidity. Using a sauna regularly offers many health benefits. Both infrared and steam saunas offer similar benefits. However, infrared saunas are the better option, especially if you have breathing and respiratory issues because the heat and humidity of steam saunas can make your symptoms worse.